It was a distracted driver who changed Gabby Grave-Wake’s trajectory. A Marine Corporal on track for the Naval Academy to study rocket science, Grave-Wake, was seriously injured when she was rear-ended by a minivan. She flew into his windshield before being launched across the intersection, sustaining head and spinal injuries. Graves-Wake, now a retired Marine Sgt., has traveled the world representing the US Marine Corp as a member of the Wounded Warrior battalion. In January, she came home to the Valley to start the next chapter. Within the able community, there is often a feeling that “I couldn’t do that. I couldn’t live with a disability.” Yet, somehow we do. When it happens in our adult life, how do we redefine ourselves? We caught up with Graves-Wake, to learn more about her transition as a veteran and an athlete. Following is our discussion edited for brevity and clarity. JL: What were you doing in the Marine Corps at the time of you injury? What was your plan pre-injury? GW: I was an intel analyst working with intel-battalion in the Marine Intelligence Center (MIC). I was part of the General’s briefing team for the second Marine Expeditionary Force (MEF). While doing that I decided I wanted to apply for the Naval Academy and I was prepping for that program. When I got hurt, that all went out the window because I was no longer medically qualified for the Naval Academy. I was transferred from second intel battalion to wounded warrior battalion. JL: What does that mean? GW: I went from being a part of the fighting force, to where my mission was to focus on myself and my recovery. I worked super hard to go back to full duty to go back to the fleet marine force, it just did not happen for me. But I learned a lot, I met people from different walks of life (illness, wounds from deployments, injuries, other motorcycle accidents) and we kinda all grew together, recovered together. I went to trials, I went to the warrior games, and it kind of took off from there. The games are an armed forces adaptive sports competition between the different service branches. I’m biased and I say the Marine Corps is better. Before my injury I was a martial artist full time and I earned my fourth degree black belt. I traveled all over the country for martial arts competitions. I was ranked top ten in the world several times and mentored kids in their martial art career and path. The Marine Corps has me compete in cycling, swimming, track and field. I’ve tried wheelchair basketball and seated volleyball. I enjoy track and field and sledge hockey the most. I have recently picked up cross country skiing and biathlons, and I’m a goalie for the San Diego sledge hockey team, the Ducks. JL: You’re training with Team USA as the goalie. How did that happen? 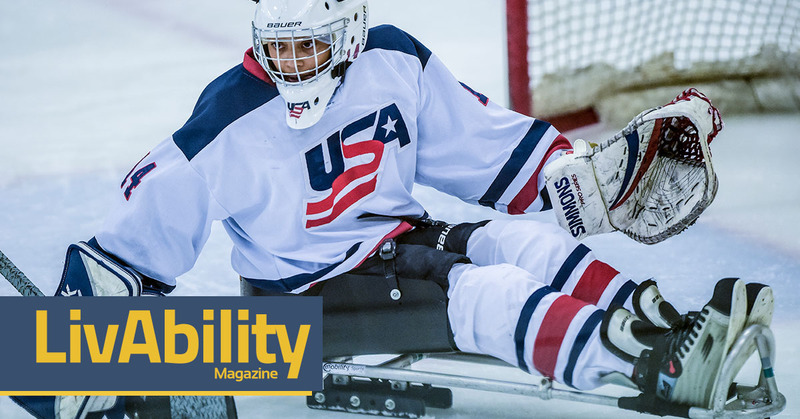 GW: In August, I went to Buffalo for the women’s sledge hockey development camp. I went to learn some new things, meet some other females in the sport, and I ended up making the roster. Once a month, we all travel to practice together and we’ll play a local team. In October, we had the awesome privilege of going to compete in Norway. We spent about a week there. We trained on the ice and played the European and Canadian women’s teams. GW: So the way that I continue to train and practice on the ice is to train with the Arizona Coyote sledge team. They’ve been very gracious about letting me get on the ice and work out with them. JL: You participated in the 2016 Invictus games in Florida. What events did you do? GW: I cycled in the time trial and the criterium, and did track and field. I brought back a silver medal and two bronze medals. JL: Immediately after your injury, you were using a wheelchair fulltime. Then, over the course of these 3 years, you’ve progressed to a walker, then a cane. What helped you make that transition? So when I was not able to walk with a neutral or normal gait, then the focus became “can we get you to walk independently without any pain.” And when I was able to do that it was a big deal because I was able to walk again and do all the things I wanted to do without a cane or walker or wheelchair. JL: And now, these new braces, Tell us about those. GW: These are IDEOs, a brace provided by the military based on the cheetah running blade technology. It works by loading the bars at the back of it through the toes. It allows me to go from heel to toe and it allows that energy return to help kick my knee forward so when I need to do something dynamic like changing directions, I can do that with less effort. It also keeps my ankles and feet in one position because due to the spasticity in my muscles my feet started to rotate up. JL: What’s the Return To Run program? GW: The Return To Run program is an 8-16 week program that allows new IDEO users to learn how their brace works and how it can help to improve their quality of life and the ideal is that someone is limb salvaged and pending amputation but one last effort to try and save their limb would be an IDEO. GW: I like to think I have a plan, but right now I’m just readjusting to life outside the Marine Corps, I’m trying to figure out where I fit in, and what my purpose is now that it’s not a set mission. I’m hoping to do something in the Aerospace engineering world. The ideal job would be something with NASA, or working for a program like Space-X to further human space travel and maybe get humans to other parts of the world and universe. I am an Aerospace Engineering major and I start school in May at Embry Riddle full time. I’m going to continue to train in track and field. We’re working right now to see if the coach out there will allow me to go out to track practices and push around and we’re getting my dorm set up so that I can have the roller in the room, and I’ll go out to the ice rink for stick time and open hockey to get some pucks on net. I figure I just got out of the Marine Corps, I’m 23 years old. The only other thing after school is to work the rest of your life so might as well spend time learning for a while. Jennifer Longdon is known to drink too much coffee, ask too many questions and then write about it. She has served on numerous Boards and Commissions focused on disability advocacy including the Phoenix Mayor’s Commission on Disability Issues, the Statewide Independent Living Council and the Christopher and Dana Reeve Foundation Public Impact Panel. Jen has a T-4 spinal cord injury and uses a wheelchair full time.